one regularly-published comic book. That, in itself, was an innovation — within a year, Fawcett had America's Greatest Comics, MLJ had Jackpot Comics, Marvel had All Winners Comics, and several others were either on the stands or about to be; but All Star, with a Summer, 1940 cover date on #1, was the first. But the real innovation came in the third issue, when they put the "All Star" characters together in one story. It was quite likely the idea of editor Sheldon Mayer (who also created Scribbly, Sugar & Spike and The Three Mouseketeers), but at this late date nobody really knows for sure. Certainly, however, it was the start of something big. Superman and Batman were honorary members, and occasionally put in an actual appearance. Wonder Woman joined in #11. Others who participated are Starman, Dr. Mid-Nite, Mr. Terrific, Wildcat, and The Black Canary. In a 1985 retcon, a new character, Fury, and an old. hitherto-ignored one, Miss America, were shoehorned into the original series after the fact, but they weren't in the actual comic books. 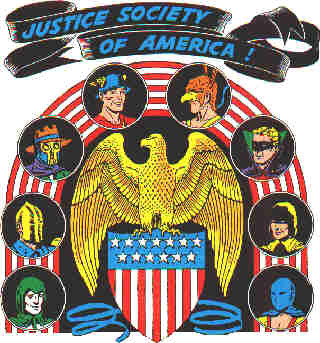 The JSA outlived the individual series of most of its members, lasting the rest of the 1940s and then some. By that time, however, superheroes were definitely passé. With its 58th issue (Apr-May 1951), All Star Comics became All Star Western, whose lineup included The Trigger Twins, Strong Bow, and a completely different character named Johnny Thunder; and the Justice Society was no more. Five years later, however, superheroes started coming back. A new Flash in 1956 was followed in 1959 by a new Green Lantern; and in 1960, the new crop of heroes was gathered together as The Justice League of America. By '63, the revival was in full swing, and the JSA itself was brought back for a series of annual crossovers with the Justice League. In 1976, All Star Comics was re-started. Some characters were updated, and a few new members were added, but in essence, it was the JSA of old. The revival lasted only a couple of years, but since then, with mini-series, specials, back-up features and whatnot, comics' first superhero group has never been long out of the limelight. During the 1980s, recognizing that they were getting a bit long in the tooth even for comic book characters, DC, at the impetus of writer Roy Thomas, started a second-generation Justice Society, called Infinity Inc., consisting mostly of the sons and daughters of JSA members. At the same time, Thomas wrote and edited a series set in the '40s, titled All-Star Squadron, which included the JSA as well as nearly every other 1940s superhero DC owned. In 1999, DC launched a new Justice Society title, JSA, which features the group as it is today. Members and successors of the '40s JSA aren't the only ones featured — so are many other current heroes with strong ties to those of that decade. Characters without direct JSA ties who have participated include Captain Marvel, Air Wave, Power Girl, Phantom Lady and more. Nowadays, practically every superhero is or has been a member of one group or another. You can't walk across the street in the average superhero universe without tripping over an army or two of superheroes. But there was a time when teaming up the super guys was an innovative thing to do, and that's how far back The Justice Society of America goes.